Nylon screw allows for clamping to any sight bar for hands free operation. 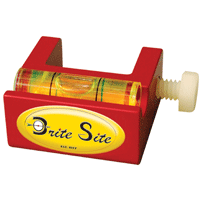 Perfect complement for Brite Site's 3rd Axis Leveler. Can be used in the field to check sight alignment. Perfect addition for any tool box.